Cowboys and Aliens are coming to a theatre near you this July and no, I'm not pulling your leg. With a cast which includes Harrison Ford and Daniel Craig, Ron Howard producing and Steven Spielberg as executive producer, this movie should be good. Or should we say could be good...the premise is a bit, ah, odd. The story? Well very simply put, a spaceship arrives in the wild west and the cowboys try to protect their world. It is based on a 2006 graphic novel created by Scott Mitchell Rosenberg and written by Fred Van Lente and Andrew Foley. Somehow Cowboys and Aliens reminds me of Gunless, the Canadian story of the cowboy...without a gun. Possibly because they are westerns with a twist and boy does this one have an unusual twist! Cowboys and Aliens opens in movie theatres July 29, 2011. I'm not sure what to think of Cowboys and Aliens...how about you? 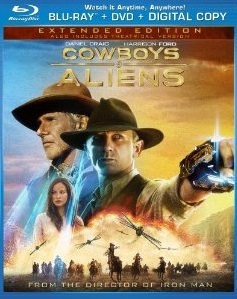 Click here to order your copy of Cowboys and Aliens on blu-ray or DVD. The title alone is enough to elicit a double take. Looks different, that's for sure. I hope it's a hit! Why Is Tron (1982) So Hard To Find? Which Will Be The Best True Grit Movie?